This is an increasingly rare instrument called the Paget Angle Sextant which was designed toward the end of the 19th century and originally marketed by Henry Hughes & Son. This particular example is signed ‘THE PAGET ANGLE SEXTANT, H. HUGHES & SON, 59 FENCHURCH St, LONDON’ on the ivorine overlay. The sextant has a black alloy frame consisting of two circular plates, the upper having an ivorine overlay. The sight has one pinhole mounted within the frame and the instrument has an outer ivorine scale from 0° to 90° to 0° by 30 arc minutes. The scale is read by a black indicating line on the ivorine part of the index arm. Dating to the early 1900's, it's housed in a mahogany case measuring 185mm x 155mm x 70mm which is in good condition, total weight is just under 1.2kgs. In good working order with clean mirrors, these sextants are becoming more difficult to find in good condition and in their original box. Dating to around the mid 19th century, this brass pocket sextant is engraved 'J. B. Dancer Manchester - P.L.G.B.' either side of the scale. Son of Josiah Dancer, also an optician, John Benjamin Dancer was a pioneer inventor and instrument maker who operated out of 43 Cross Street, Manchester between 1847 until his death in 1887. His trade card included the statement 'By appointment to Her Majesty's Commissioners. Prize Medal 1862'. Although the sextant has lost some of its brass lacquer in places, it is in good undamaged condition with a screw on outer cover. The main body features a pinhole viewfinder (with sliding brass shutter) with the lenses, mirrors and coloured filters all being in good working order, and despite some tarnishing the silvered vernier scale (range 0 - 150 degrees) is still fully legible. Measuring 70mm diameter and 40mm overall depth, it weighs just over 500 grams and comes in a modern drawstring pouch for protection when not in use. Dating from the latter part of the 19th century, this is a brass pocket sextant made by Troughton Simms and signed 'Troughton & Simms, London', on the face above the silvered vernier scale. It comes complete with a separate two part extending telescopic sight, incorporating a removable screw on sun filter, and two further retractable filters within the sextant drum itself, all housed in a leather case (repaired strap) impressed WCEW on one side. Constructed of brass with a black finish and lacquered brass fitments, it's in very good condition all round, with hardly any paint loss on the outer drum cover, although there is a small dent on one edge of the the sextant body and drum, see photos. The lenses, mirrors and filters are all in good order, and the sextant can be used with or without the telescope, as it also has the sliding brass pinhole shutter. In full working order, it measures 75mm dia x 45mm closed depth and weighs just over 550 grams with its case. Dating from the early part of the 20th century, this is a brass pocket or box sextant which although unsigned was probably made by one of the major makers of the day. Comes complete with a separate two part extending telescopic sight, incorporating a removable screw on sun filter, and two further retractable filters within the sextant drum itself, all housed in a fitted leather case. Constructed of brass with a black finish and lacquered brass fitments, it's in very good condition all round, with some minor paint loss on the outer drum cover, and the lenses, mirrors and filters are all in good order, as is the leather case. Both the sextant and leather case have the letters R.E.M. which I presume to be a previous owner. Can be used with or without the telescope, as it also has the sliding brass pinhole shutter, this is as complete an example as one could hope to find. Not to be confused with replicas on other sites! Dating from the early part of the 20th century, this is a brass pocket or box sextant made by W F Stanley and signed 'Stanley London', on the face above the silvered vernier scale. Constructed of brass with a black finish and lacquered brass fitments, it's in very good condition all round, with some paint loss on the outer drum cover, but the lenses, mirrors and filters are all in good order, as is the leather case. Can be used with or without the telescope, as it also has the sliding brass pinhole shutter, this is as complete an example as one could hope to find. In full working order, it measures 75mm dia x 45mm closed depth, and weighs just over 0.7kg with its case. A fine example of a pre WW1 pocket sextant, engraved 'Supplied by Broadhurst Clarkson & Co, 63 Farringdon Road, London E.C.' on the outer cover, which is of tthe screw threaded type. Constructed of brass with a black finish and lacquered brass fitments, it's in very good condition all round, with some paint loss. The lenses, mirrors and filters all being in good order, as is the silvered vernier scale (range 0 - 130 degrees). Viewing is through the sliding brass pinhole shutter, but this particular model also has the threaded aperture, so can take the extending telescope sights that were often supplied as an optional extra. (not included). In full working order, it measures 80mm diameter x 45mm closed depth, and comes with a leather case which is also in good condition, although the short tongue strap has lost its end so no longer reaches the buckle strap. This is a WW2 MK VI field clinometer made by Stanley London, with the serial number 41520 and dated 1940. Used by artllery regiments for measuring & setting the elevation of heavy gun barrels, it is a precision instrument which appears to be in working order, and good cosmetic condition, with only some paint loss of the black japanned finish where it was presumably clamped to a gun. Also known as a gunner's quadrant in the USA, it measures 6.5" x 5.5" and comes in its original mahogany case which measures 7.5" x 6.5" and is also in good sound condition. A substantial instrument, it weighs 2.5 kgs packed, so unfortunately overseas shipping is not cheap! Please note: due to weight, delivery will be by courier, therefore it is important that a contact telephone number be entered through the shopping cart at checkout stage, and also note that items cannot be shipped to PO boxes as these are not catered for by couriers. This WW1 military pocket or box sextant is signed on the face 'Heath & Co Ltd, 1915, No 2364', and also engraved with the War department military arrow. Constructed of solid brass with original black anodise finish, the outer cover is of the bayonet fixing type and has the same makers marks engraved on the outside. Inside the cover is a paper inlay, displaying a table of natural tangents fitted inside. The anodised brass fitments and silvered dial (scale 0 - 130 degrees) are all in very good condition, as are the lens, mirrors and filters. In full working order, it measures 80mm diameter x 45mm closed depth, and comes with a leather case which is also in good condition. This 19th century instrument is called an optical square or a right angle prism, it's purpose being to facilitate the layout of a grid pattern, by enabling one to see lines to the left or right which are 90 degrees to the line of sight being viewed through the pinhole viewer. Dating to circa 1860, it's engraved on the brass drum 'STANLEY LONDON' who was William Ford Stanley, a mathematical instrument maker who set up in business in the 1850's. Although the name Stanley has been widely copied by makers of reproduction instruments, please rest assured that this is a genuine Stanley piece! In very good condition including the mirrors, it comes with its original silk and velvet lined outer case, emblazoned 'STANLEY Gt. 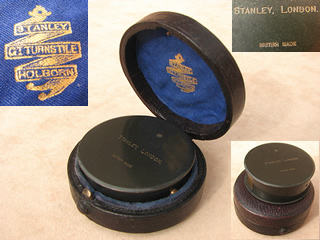 TURNSTILE HOLBORN' on the silk lid lining.The case is also in sound condition including the release button which fastens the lid. In good working order and measuring 50mm in diameter and 17mm in depth, it is a well made instrument, with a substantial feel to it. The fishskin covered outer case is also in sound condition including the release button which fastens the lid, and measures 65mm diameter by 25mm deep. Although Thomas Cooke and his two sons Frederick and Thomas became partners in 1856, the name T. Cooke & Sons Ltd was not adopted until 1897. The firm was acquired by Vickers Ltd in 1916 who merged it with Troughton and Simms to form Cooke, Troughton & Simms Ltd in 1922. This particular box sextant is signed on the outer cover 'T. Cooke & Sons Ltd, London & York', so it's likely it was made at the turn of the century and before WW1. The outer cover is of the screw threaded type, which serves also as a base for the top section and inside the cover there is a paper inlay, on which is printed a table of natural tangents. It comes complete with a separate two part extending telescopic sight, incorporating a removable screw on sun filter, and two further retractable filters within the sextant drum itself, all housed in a fitted leather case. Constructed of brass with a black finish and lacquered brass fitments, it's in very good condition all round, with minimal paint loss, lenses, mirrors and filters all being in good order, as is the silvered vernier scale (range 0 - 140 degrees). In full working order, it measures 78mm dia x 40mm closed depth, and weighs just under 0.6kg with its case. Boettger became sole agents for Siemens Brothers in South Africa from 1880 and its likely this instrument was supplied by Siemens for onward retail, which in this case appears to have been local government as it'sengraved 'Public Works Dept' on the base. Constructed of solid brass with a black anodised finish that is still mostly intact, the silvered vernier scale is also in excellent condition, with all markings present and readable. The outer cover is of the screw threaded type, and serves also as a base for the top section. Inside the cover there is a paper inlay, on which is printed a table of natural tangents. The lacquered brass fitments and silvered dial (scale 0 - 140 degrees) are all in very good condition, as are the lens, mirrors and coloured filters. In full working order, it measures 70mm diameter x 35mm closed depth, and there is no leather case. 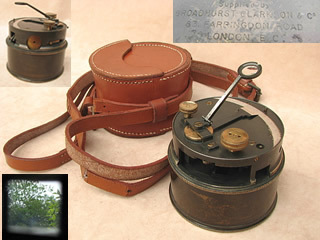 This is a unique set consisting of a box or drum sextant with a separate cased artificial horizon, housed in the same purpose made leather case. Made by Troughton & Simms in London, it belonged to the British Equestrian Olympian Herbert Stewart Lauriston Scott, who competed at the 1912 Stockholm Olympics, coming a very credible fourth in the individual jumping event. He had a distinguished and versatile career, becoming a Captain in the Cavalry regiment the 4th Hussars, the same regiment that Winston Churchill had served in. While serving in France during WW1, he also gained his Aviators certificate (no 1254) at the British Flying School at Le Crotoy, France in 1915. He went on to become a Major in the 4th Hussars after they were re-titled the 4th Queens Own Hussars in 1921. He was born in 1885 and died in 1966. The box sextant comes complete with a separate two part extending telescopic sight, incorporating a removable screw on sun filter, and is housed inside the sextant body for transit, which also contains two further retractable filters on levers. The artificial horizon is contained in its own silk & velvet lined red moroccan leather covered case, and also has a separate glass vial which I believe is the original spirit level, although the liquid is no longer present as there is a small hole at one end of the glass. (shown in photos). Both the sextant and artificial horizon are engraved ‘Troughton & Simms, London’ and the sextant cover is also engraved ‘H.S.L. SCOTT, 4th HUSSARS’. I have never come across a set like this, and suspect it was made specially to order, I doubt you will ever see another like it, and certainly not with such provenance. In good working order with the exception of the glass spirit level which I’m sure could be refilled and sealed, the cosmetic condition is also exceptional. Made by Short & Mason, this is a pre WW1 military MK V drum clinometer probably used by artillery units in the British Army as an aid for targeting heavy guns. Dated 1908, it measures 70mm in diameter and is quite an ingenious device, simply turn it on its side, peer through the pinhole viewfinder, depress the button and the scale inside swings according to the angle that is being viewed, releasing the button locks the reading taken. The clinometer is engraved 'SHORT & MASON LTD, LONDON, 1908, V, No 4233' along with the military arrow, and is in really good condition with virtually no loss of its bronze finish. It comes with its leather case impressed 'D.T.JACKSON& Co Ltd, 2000, LONDON. S.E. ', which as can be seen from the photos is also in fine condition, although there are ink letters presumably of a previous owner on the reverse. In full working order, it would be hard to find another example of this age in such good condition. A late 19th century, brass box sextant, signed on the face 'Elliott Brothers London', and dated 1892. The outer cover is of the bayonet fixing type with a brass carry handle, and serves also as a base for the top section. Inside the cover there is a paper inlay, on which is printed a table of natural tangents, along side the Elliott Bros name. The lacquered brass fitments and silvered dial (scale 0 - 150 degrees) are all in very good condition, as are the lens, mirrors and coloured filters. There is a War Department arrow with the letters WD 36 on both the underside & cover of the sextant, and is also impressed on the leather case. This could be a war department serial number or perhaps the year (1936?) that it was acquired for military use. In full working order, it measures 70mm diameter x 35mm closed depth, and comes with its leather case which is also in good sound condition, and has the initials F. W. B. An excellent example of an early 20th century pocket or box sextant, signed on the face 'Newman & Guardia Ltd, London.W, no 4531, 1918'. Dated 1918, the design is identical to those used by the British Army in WW1, but this does not have the war department military arrow, so may have been a private purchase. Constructed of solid brass with original black anodised finish, the outer cover is of the bayonet fixing type and has the same makers marks engraved on the outside. Inside the cover is a paper inlay, displaying a table of natural tangents fitted inside. The lacquered brass fitments and silvered dial (scale 0 - 130 degrees) are all in very good condition, as are the lens, mirrors and coloured filters. In full working order, it measures 70mm diameter x 35mm closed depth, and comes with leather case which is also in good sound condition. A late 19th century, brass box sextant, signed on the face 'Elliott Brothers London'. Constructed of solid brass with a black anodised finish that is all still intact, the silvered vernier scale is also in excellent condition, and all markings present and readable. This particular model is slimmer in depth than others that I have seen, and is designed for readings to be taken through a 2 stage sliding brass pinhole shutter which incorporates a red filter on the last stage, eliminating the need for separate filter arms as is more commonly found. The outer cover has a bayonet fixing with a small brass carry handle, and this also serves as a base for the top section. Dating to around 1885, the sextant is in full working order, and the lacquered brass fitments and mirrors are in good order. Overall in very good condition, it measures 70mm diameter and 30mm in closed depth, and comes with a stud fastening case. This pocket or box sextant, is dated 1918 & carries the War department military arrow showing it to be Army issue during or at the end of WW1. Made by Stanley London, it's signed on the face & the cover 'Stanley, London, No 3868, 1918'. Constructed of solid brass, still retaining all of its original black anodised finish, the outer cover is of the bayonet fixing type and has the same makers marks engraved on the outside. Inside the cover is a paper inlay, displaying a table of natural tangents. The lacquered brass fitments and silvered dial (scale 0 - 120 degrees) are all in very good condition, as are the lens, mirrors and coloured filters. In full working order, it measures 70mm diameter x 35mm closed depth, and comes with what is probably its original leather case, impressed 'D. Mason & Sons Ltd, Birmingham, 1918' which is also in very good condition.